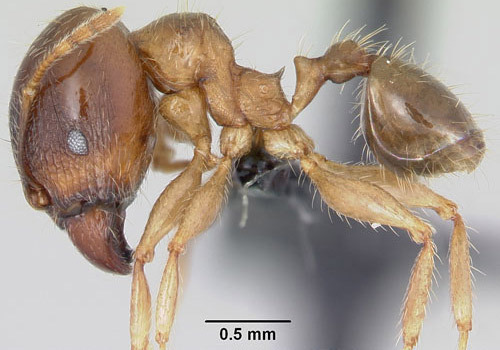 The bigheaded ant (BHA), Pheidole megacephala (Fabricius), is a very successful invasive species that is sometimes considered a danger to native ants and has been nominated as among 100 of the "World's Worst" invaders (Hoffman 2006). Figure 1. Bigheaded ant, Pheidole megacephala (Fabricius), foraging tubes on a palm tree. Arrows indicate two of the foraging tubes. Photograph by R.H. Scheffrahn, University of Florida. The BHA has been a pest in southern Florida for many years, and according to reports by pest control operators, it is becoming an even more pervasive nuisance as it displaces other ants, such as the red imported fire ant (RIFA), Solenopsis invicta Buren, and the white-footed ant Technomyrmex albipes (Fr. Smith) in some areas. 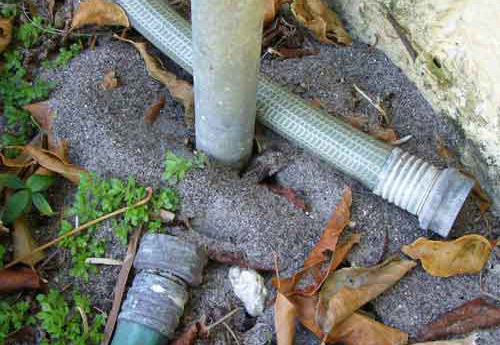 It is possible that the increase in BHA infestations was augmented by several years of excessive hurricane activity (2003 to 2005) in Florida that damaged lawns and killed trees which necessitated the use of increased amounts of sod and other replacement vegetation that may have been infested with this ant (Warner, unpublished observation). The BHA does not sting or cause any structural damage, and usually does not bite unless the nest is disturbed, and even then, the bite is not painful. 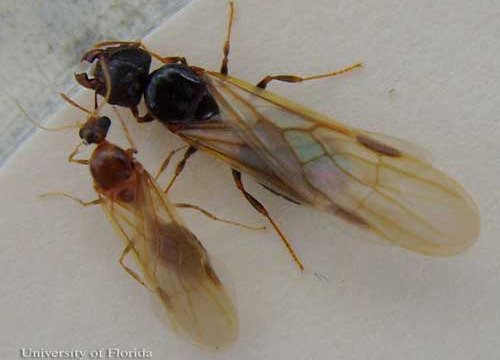 There are some 17 Pheidole species in Florida of which 14 are native to Florida (Deyrup 2003). 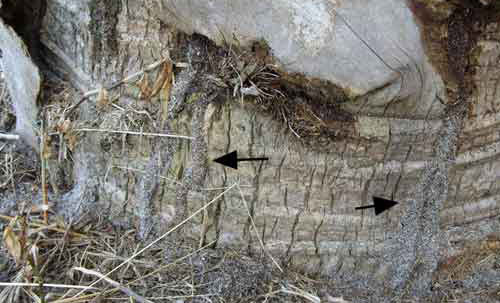 The BHA, a soil-nesting ant, is sometimes confused with subterranean termites because it may create debris-covered foraging tubes that are somewhat similar, albeit much more fragile, than termite tubes. More often these ants leave piles of loose sandy soil. Homeowners are annoyed by these "dirt piles" and by ants foraging in bathrooms, kitchens, around doors, and windows, as well as on exterior paved or brick walkways or driveways. 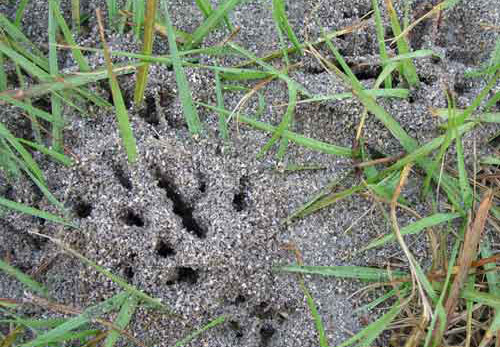 Control of the BHA is difficult because the ant colonies are numerous and populations usually extend across property lines. Figure 2. 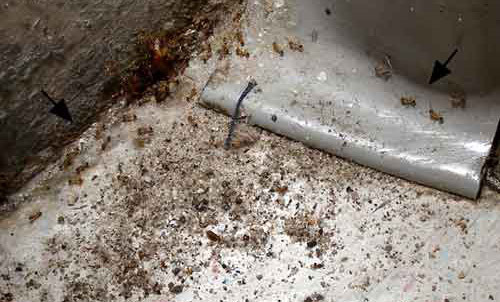 Debris caused by bigheaded ants, Pheidole megacephala (Fabricius), inside a structure on a tiled floor. Arrows indicate trailing ants. Photograph by R.H. Scheffrahn, University of Florida. Figure 3. 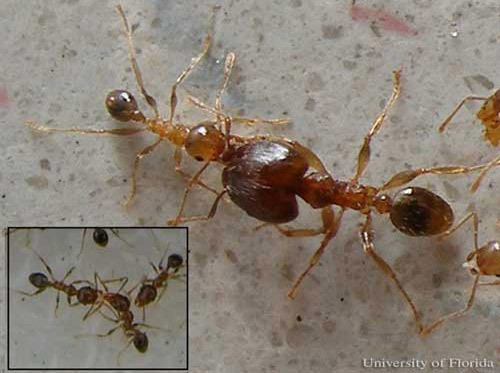 Soil displaced by bigheaded ants, Pheidole megacephala (Fabricius), excavating underneath walkways or driveways. Photograph by R.H. Scheffrahn, University of Florida. 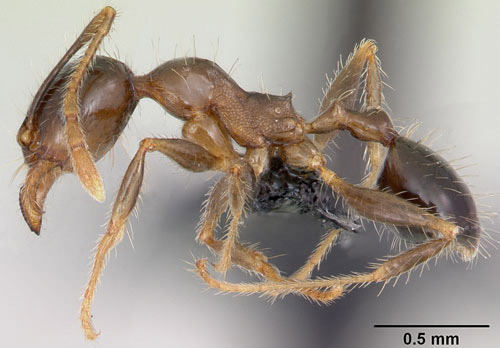 Originally recorded from the Indian Ocean island of Mauritius (Fabricius 1793), the BHA is a widespread invasive tramp ant found in many subtropical and tropical regions throughout the world. Original reports of BHA in Florida mention Everglades, Key West and St. Augustine (Smith 1933). As of 2007, the BHA has been confirmed in Alachua, Brevard, Broward, Charlotte, Collier, Dade, Dixie, Highlands, Hillsborough, Indian River, Lee, Monroe, Palm Beach, Pinellas, Sarasota, Seminole, and Volusia Counties (Ferster et al. 2000, Deyrup 2003). Figure 4. Worldwide distribution of the bigheaded ant, Pheidole megacephala (Fabricius). Map from http://www.antwiki.org. Workers are dimorphic (major and minor workers). The BHA receives its common name from the large-sized head of the major worker, or "soldier." 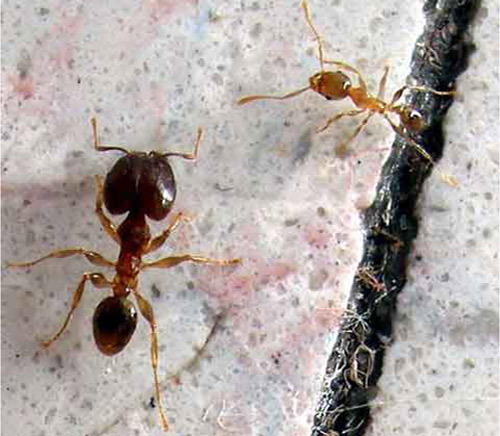 Minor workers are small (2 mm) reddish brown ants. The majors are much larger (3 to 4 mm), but only constitute about 1% of foragers. The front half of the major's head is sculptured, while the back half is smooth and shiny. The petiole (waist) of both worker forms is two-segmented and the post-petiolar node is conspicuously swollen. The antenna is twelve-segmented with a three-segmented club. The entire body is covered with sparse, long hairs. Workers have a pair of short propodeal spines (spines on waist) facing almost directly upward. There is usually a dark spot on the underside of the gaster. Figure 5. Bigheaded ant, Pheidole megacephala (Fabricius), minor (upper left) and major (lower right) workers. Photograph by R.H. Scheffrahn, University of Florida. Figure 6. Lateral view of minor worker of the bigheaded ant, Pheidole megacephala (Fabricius). Specimen is from Mauritius. Photograph by April Nobile, Antweb.org. Figure 7. Lateral view of major worker of the bigheaded ant, Pheidole megacephala (Fabricius). Specimen is from Reunion. Photograph by April Nobile, Antweb.org. Figure 8. 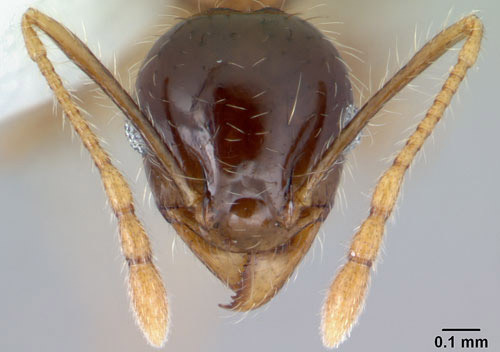 Frontal view of the head of a bigheaded ant, Pheidole megacephala (Fabricius), showing 12-segmented antennae. Front part of head is sculptured, while the back half is smooth and shiny. Photograph by Erin Prado, Antweb.org. Figure 9. Lateral view of reproductive (swarmer) caste bigheaded ant, Pheidole megacephala (Fabricius). Specimen is from Tampa, Florida. Photograph by April Nobile, Antweb.org. Figure 10. Side view of wings of a reproductive (swarmer) caste bigheaded ant, Pheidole megacephala (Fabricius). Photograph by Erin Prado, Antweb.org. 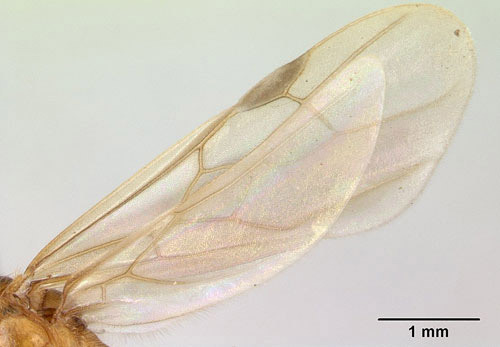 The RIFA is sometimes confused with the BHA, but the RIFA has polymorphic (many sized) workers and the BHA is dimorphic. (See nest differences below.) When disturbed, the RIFA is highly aggressive and will bite and sting, while the BHA bites but does not sting. The BHA is slightly smaller, darker colored, and less shiny than RIFA. Both nest in the soil. As with all ants, the BHA has complete metamorphosis (holometabolous). Colonies can have large numbers of fertile queens (Wilson 2003) and year-round brood production in tropical and sub-tropical areas. In some areas, colonies can form a "virtually continuous supercolony that excludes most other ant species" (Wilson 2003). Although Vanderwoude et al. 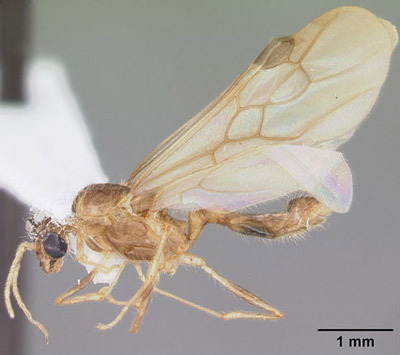 (2000) report that in Australia dispersal of new colonies is through budding without a nuptial flight, in south Florida nuptial flights of alates (winged reproductives) can be observed during the winter and spring (Scheffrahn, unpublished observations). Fertilized queens shed their wings and find a nest site where they will begin laying eggs. Figure 11. Bigheaded ant, Pheidole megacephala (Fabricius), brood found under a stone on soil. Photograph by R.H. Scheffrahn, University of Florida. Figure 12. Bigheaded ant , Pheidole megacephala (Fabricius), alates. Male (left), female (above, right). Photograph by R.H. Scheffrahn, University of Florida. According to Hoffman 2006, incubation time of eggs ranges from 13 to 32 days. Duration of the larval stage ranges from 23 to 29 days. Duration of the pupal stage ranges from 10 to 20+ days. Life spans of minor workers have been shown to be 78 days at 21°C, and 38 days at 27°C. Queens are reported to lay up to 292 eggs per month. The BHA is omnivorous, feeding on sweet liquids such as honeydews, dead insects, and soil invertebrates. Foragers will quickly recruit nest mates to a food source. Foraging tunnels having numerous entrances can be seen along the soil surface. 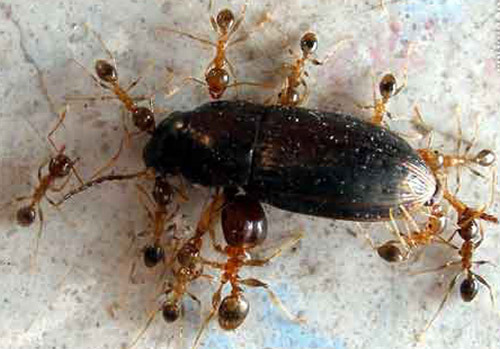 Arthropod prey are dissected by workers and brought back to the nest. Figure 13. Bigheaded ant , Pheidole megacephala (Fabricius), minor workers and one major worker combine their strength to move a dead beetle. Photograph by R.H. Scheffrahn, University of Florida. Trails of foragers can often be observed along trees trunks, sometimes climbing into canopies of tall trees. Similar trails might be seen on the exterior walls of structures as ants climb into attics or other natural or artificial voids. Trophallaxis (an exchange of food between ants) is frequently observed between two minor workers, or a minor and major worker. Figure 15. Trophallaxis between major and minor workers, and between two minor workers (insert), of the bigheaded ant, Pheidole megacephala (Fabricius). Photograph by R.H. Scheffrahn, University of Florida. 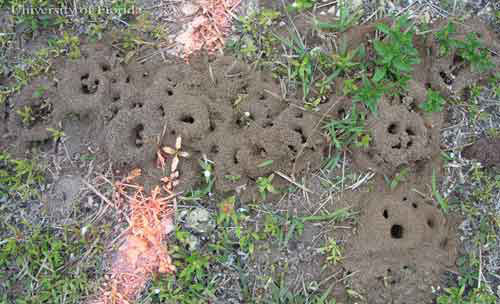 The BHA can be found nesting in disturbed soils, lawns, flowerbeds, under objects, such as bricks, cement slabs, or flower pots, around trees or water pipes, along the base of structures, and walkways, where displaced soil is usually observed from the action of ants digging below the surface. Well-cared-for lawns may have BHA infestations that are less noticeable, except along the edges where lawns meet walkways where piles of soil are often deposited. BHA populations expand into neighboring areas by following along these lawn-walkway edges or roadways. Population movements into new areas to establish nests and subsequent displacement of other ant populations can be rapid (Hoffman 2006; Warner, unpublished observations). Figure 16. Bigheaded ant, Pheidole megacephala (Fabricius), nest site in sandy soil after rain. Photograph by R.H. Scheffrahn, University of Florida. Figure 17. Soil displaced by bigheaded ants, Pheidole megacephala (Fabricius), digging around a water pipe. Photograph by R.H. Scheffrahn, University of Florida. Nests of RIFA are similar to those of the BHA. Careful observations will distinguish either the larger major workers of the BHA, or, if the nest if RIFA, polymorphic aggressive ants will emerge from the nest after a slight disturbance. Figure 18. Red imported fire ant, Solenopsis invicta Buren, nest in sandy soil. Photograph by R.H. Scheffrahn, University of Florida. Paratrechina bourbonica (Forel) - 4%. At present, pest control companies are using residual spray products containing fipronil, bifenthrin, or permethrin, sometimes in conjunction with granular baits. Lawns and flowerbeds are sometimes treated with granular insecticides containing fipronil or lambda-cyhalothrin. The senior author has found permethrin to be ineffective for BHA. In an experiment against BHA performed at the University of Florida’s Fort Lauderdale Research and Education Center (FLREC), two residual products tested provided some degree of control for about two weeks: Transport (27% bifenthrin, 23% acetamiprid) and Arena (50% clothianidin). Two of the baits tested in this experiment provided control up to about 4 weeks: Siesta (0.063 % metaflumizone) and MaxForce (0.0005% fipronil). Further testing might include baits which contain an insect growth regulator, such as Extinguish Plus (hydramethylnon 0.365%, S-methoprene 0.250%). In one experiment, a methoprene bait was found to be effective in reducing a BHA population (Lee, et al., 2003). 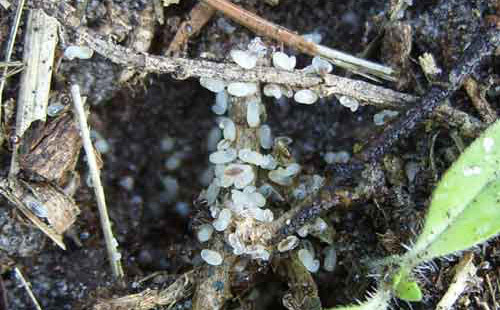 Whichever products are eventually determined to be the most effective in controlling this pest ant, it seems imperative that treating lawns, ornamental areas, and disturbed soils be included in any pest control program. Pest control companies doing residential perimeter treatments must have supplemental applications done to the lawns, flowerbeds, around trees, along walkways and on driveways made of bricks. To obtain adequate coverage, using a truck-mounted “power-sprayer” for residual pesticides is suggested. The senior author has spoken to numerous lawn treatment companies and it seems to be a universal policy that ants are not considered to be pests of lawns and these companies will not make treatments for BHA. Even so, because ants are, after all, insects, insecticidal treatments to lawns will most likely have an impact on the ant populations. Since this ant reproduces so prolifically, and nest sites are often protected by being under objects, lawns and flowerbeds will probably need to be treated at least four to five times per year at maximum label rates. One-time treatments for the BHA will be of very limited value. BHA entering into structures can be baited with sweet liquid-based ant baits, insecticidal gels, or sprayed with a residual insecticide, always in conjunction with treatments to the exterior of the structure as mentioned previously. 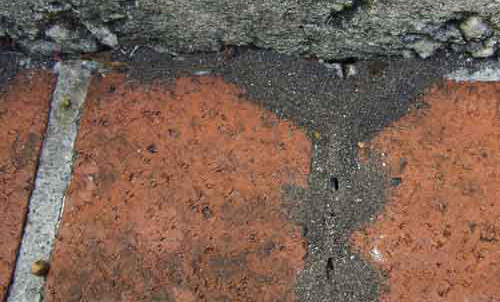 Ants nesting in wall voids can be treated with insecticidal dusts or foams, or with baits placed near void entrances. Baiting programs can sometimes take several weeks for significant population reductions. (Warner et al. 2008) Residential properties adjoining infested properties of neighbors necessitate cooperation in order to control the infestation. When properties border unoccupied infested areas, often the homeowners' association will need to be contacted to arrange treatments for those areas. It should be stressed that if infested properties adjoining the property being treated are not also treated, ants will quickly enter and reinfest the treated property. Without area-wide control treatments, local retreatments are to be expected. Note: for all insecticidal treatments, always follow label directions! Figure 19. 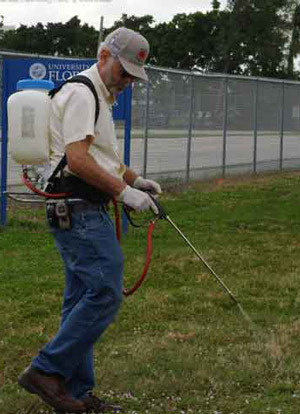 Senior author spraying a residual product on a bigheaded ant, Pheidole megacephala (Fabricius), test plot at the University of Florida's Ft. Lauderdale Research and Education Center. Photograph by R.H. Scheffrahn, University of Florida. Creighton WS. 1950. The Ants of North America. Bulletin of the Museum of Comparative Zoology 104. 585 p.
Deyrup M. (2003). An updated list of Florida ants (Hymenoptera: Formicidae). Florida Entomologist 86: 43-48. (30 April 2013). Fabricius JC. 1793. Entomologia Systematica Emendata et Aucta. Secundum classes, ordines, genera, species. Adjectis synonimis, locis, observationibus, descriptionibus. Hafniae: C.G. Proft 2 viii. 519 pp. Fasulo TR. (2002). Cockroaches and Pest Ants.. Bug Tutorials. University of Florida/IFAS. CD-ROM. SW 157. Ferster B, Deyrup M, Scheffrahn RH. (2000). The pest ants of Florida. (30 April 2013). Hoffman B. 2006. Pheidole megacephala (insect). CSIRO Sustainable Ecosystems. (30 April 2013). Klotz JH, Mangold JR, Vail KM, Davis Jr LR, Patterson RS.1995. A survey of the urban pest ants (Hymenoptera: Formicidae) of peninsular Florida. Florida Entomologist 78: 109-118. Lee CY, Lee LC, Na JP-S, Teo EH-H. 2003. Evaluation of methoprene granular baits against foraging Pharaoh ants, Monomorium pharaonis (Hymenoptera: Formicidae). Sociobiology 41: 717-723. Smith MR. 1933. Additional species of Florida ants, with remarks. Florida Entomologist 17: 21-26. Vanderwoude C, Lobry De Bruyn LA, House APN. 2000. Response of an open-forest ant community to invasion by the introduced ant, Pheidole megacephala. Austral Ecology 25: 253–259. Warner J, Yang R-L, Scheffrahn RH. 2008. Efficacy of selected bait and residual toxicants for control of bigheaded ants, Pheidole megacephala (Hymenoptera: Formicidae), in large field plots. Florida Entomologist 91: 277-282. Wilson EO. 2003. Pheidole in the New World, a Dominant, Hyperdiverse Ant Genus. Harvard University Press. Cambridge, MA. 794 pp.